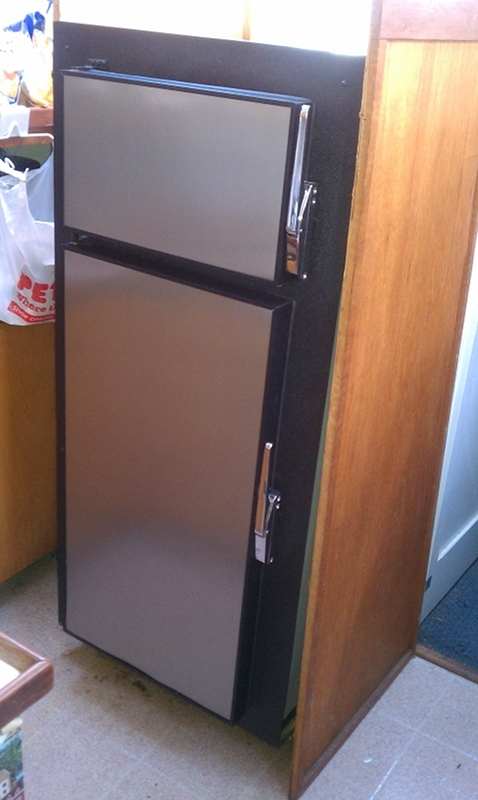 Today we finally got the elusive fridge. It took quite a bit of weird paper chasing, phone calls and other insanity, but the order was confirmed and delivered to Fisheries Supply on Thursday. We were told we could pick it up on Friday, but had to wait until Saturday, because that’s when we could abuse… I mean beg help from our friends. The amazing Cherie, plus Suezie (the gorgeous) and Ellen (the “Swiss-Army-Knife of friends”) met us at Fisheries at 9:30 AM in Cherie’s nifty vehicle and we loaded up the much-chased-after fridge. The separate compressor and AC/DC power supply were loaded into the trunk of my Anonymobile and we caravanned to the marina where the fridge was unloaded. We already knew the fridge was too large to fit down the main hatch (by one inch), so Mr. Kat removed one of the main cabin windows while the ladies and I walked Pupzilla. After very close to an hour, Bella–far too distracted by the many people (with food!) and dogs walking around the marina–refused to reward us with a “deposit”. Bella is distracted from her "duty"
So, we trekked back to the boat to check on the progress of the window removal. The window was out and lifelines were coming down so it was time to tie up the dog where she could watch, but not get in the way, and then lift the fridge into the boat. Cherie and I came inside while Mr. Kat, Ellen, and Suezie lifted and maneuvered the fridge through the gaping window–quite a distance to hold up 80 pounds of fridge…. 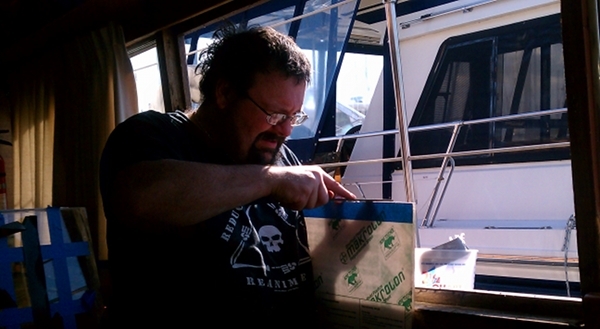 Cherie and I caught the fridge and lowered it down to stand in the main cabin, then Mr. Kat rejoined us inside and he and Cherie and I lifted it over the starboard galley counter and down into the galley. I took the ladies out for the famous fish sandwiches at Bad Albert’s, but since it was Brunch menu, there was no “feesh” to be had. We actually had very tasty-looking breakfast. I say “tasty looking” because I’m still on a fat-free and egg-yolk free diet, so I had dry toast and iced tea while they nominated on the foodage. They said it was good, at least…. After the chowing down, the ladies headed off to accomplish many other things, while I returned to help Mr. Kat with the window stuff and so on. Mr. Kat had moved the fridge onto its platform, but it had not yet been (and is still not) hooked up, since there were more pressing things to deal with–like the missing window. During removal, the rather old plate glass had cracked a bit and we felt it was smarter to replace it with heavy plexiglass instead. We went out and acquired the plexiglass–which resulted in our having to pay for an hour’s parking when we only stayed for 20 minutes due to the new Seattle parking meter system grrr….–and returned to install the plexiglass. I took the dog out for yet another try at relief while Mr. Kat prepped the window installation. I was victorious–Bella suddenly becoming a model citizen who actually did her business on command–but Mr. Kat was not (victorious, that is). The plexiglass, while the correct size, was not cut with the correct mildly-trapezoidal angles that had missed our observation when measuring. Oops. I found Mr. Kat carefully filing down the square-but-shouldn’t-be sides to fit the frame. Many thanks to the All-Girl Crew of Fabulousity and Fridge Moving, and to Mr. Kat for… well for being Mr. Kat. 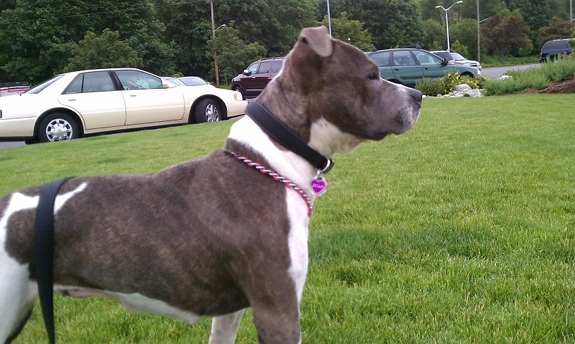 This entry was posted in at last!, boat stuff, cool people, PUPdate. Bookmark the permalink. Now that is a fine looking fridge! Soon you will be cooling foodstuffs right there in your floating home. YAY for Bella getting the hang of important commands. Woohoo! Yay for Bella and the new fridge. Boo for the window breakage. Here’s hoping things get installed and working in tip top condition soon! Impressed by your ability to round up resources. Go you and Yay! friends. Not to mention Mr. Kat. Am glad when a plan comes together. It’s such a ballet.